Nice one. Out of interest, who did you use to press your vinyls? is there going to be a cd single version?, as much as i love the artwork i dont have a record player! go on and give away a cdr of the tracks with the single jist like shellac. I'm going to get a copy and then burn dozens onto to cd and then sell them for 2. Very reasonable. I'll 'ave een. its here, and its cool....doors 8pm tonight....get your 7"'s here!! Sharon. I couldn't make it on sunday. Can you hold one for me if they are likely to go fast. Will there be any at the Step on it gig tomorrow? If your going can you bring one for me please? a wee look at the front cover! remember, now also available online for all those too lazy to pop to your local record shop!! 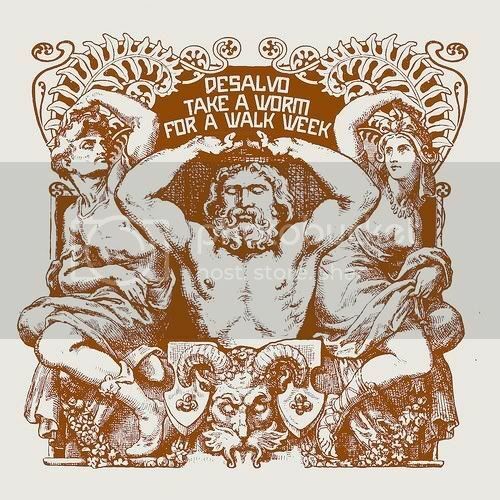 Here's a split 7" by Take A Worm For A Walk Week and Desalvo on Dizzy Storm records. For A Walk Week eh? so when does the gold disc arrive?